This is pretty close to my own view. My extra take is that any “irrational” behavior – and so anything that the “million models” generate – can be rationalized, either by revising what we assume that the decision-maker cares about, or by adding constraints on the decision-maker’s ability to choose: the question of rationality is a red herring. Daniel Kahneman has a new book, “Thinking Fast and Slow“, that is prompting a lot of excellent articles about his work. For example, Vanity Fair has a nice article by Michael Lewis. Back when I was an undergraduate, Kahneman and Amos Tversky’s Prospect Theory paper was one of the first academic papers I read that motivated me to become an economist. The agent of economic theory is rational, selfish, and his tastes do not change. will do the best she can to achieve the things she cares about. This is what we mean by rationality. The great thing about this assumption is that it is completely flexible – it can accommodate any preferences at all. For example, the decision-maker might care about the wellbeing of her neighbor, and so give up some of her own material wealth to help her neighbor be better off. This is both rational and selfish! For any decision we observe, some preferences will rationalize it. As economic theorists, the crucial assumption is therefore not rationality, but on what it is that the decision-maker cares about and what constraints there are on her making a good decision. The great contribution of Kahneman and Tversky was to present evidence on the psychological constraints on our decision-maker’s ability to achieve the things she cares about. Making decisions is hard: even if I know what I want to achieve, “doing the best I can” is subject to how I process the options I have to choose from. Rationality is not supposed to be a realistic model of the process by which people actually make decisions. Rather it attempts to capture the outcomes of decision-making in a plausible way, so that we can try bit by bit to analyze economic settings without simply saying “people are completely unpredictable, so let’s give up”. Kahneman and Tversky helped to show how to write models of rational choice that better reflect the decisions we observe people make. The opening credits of Aki Kaurismäki’s “Le Havre” give prominent billing to Laika, a dog playing herself, and promise the appearance of a sixtysomething French blues-rocker by the name of Little Bob. This gives a good idea of the tone of the optimistic, understated confection that will follow. Marcel (André Wilms) describes himself as a former Paris bohemian and artist. But now he is a sixty-year-old shoe-shiner, living by the sea in Le Havre with his wife Arletty (Kati Outinen). His neighborhood, and the film, seem to have skipped at least three decades, buildings, furnishings, stores, clothes and cars all of at least 1970s vintage. There are no young people here – the population of Marcel’s neighborhood are like him, quietly and contentedly departing middle-age. The quiet town is roused by the discovery at the port of a shipping container containing a couple of dozen Gabonese emigrants. The container was supposed to end up in London but has landed in Le Havre. All but one of the people inside are detained: a boy, Idrissa (Blondin Miguel), runs away. By chance, while hiding from a police force led by the marvelously deadpan Monet (Jean-Pierre Darroussin), he crosses paths at the dock with Marcel, who offers him food and later returns to leave more food and cash. At the same time as Idrissa enters the lives of Marcel and his neighbors, Arletty leaves. She is hospitalized with severe illness, and the outlook is not good. “Miracles do happen,” is all that her doctor can offer; “not in my neighborhood,” she replies. This is by a large margin as pessimistic and reflective as anyone will get in this story of simple, pragmatic kindness. Arletty languishes as Marcel and his neighbors, without complicated plotting or discussion, undertake without fanfare to perform a miracle and get Idrissa to London, where his mother awaits him, before he is caught. What is the nature of the mirror between Arletty and Idrissa? We see Marcel tender and concerned, journeying daily to his wife’s decidedly not modern hospital room, but she sends him away, not wanting to be seen ravaged by her treatment, keeping the extent of her illness from him. She seems almost to be playing the role of a guiding angel for Idrissa, having been displaced by him and now granting her husband the time to help him. But as Marcel protects Idrissa and figures out how and where to send him onward, he cannot be there for his wife as her condition seems to grow more dire. If he succeeds with Idrissa, what about his wife? Are Arletty and Idrissa’s fates linked or opposite? 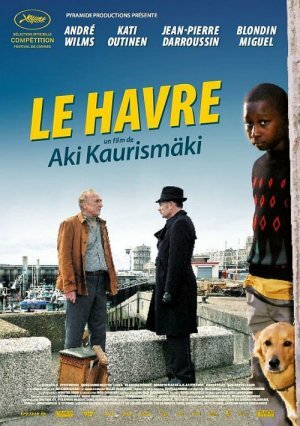 For a plot that is ostensibly cat-and-mouse, “Le Havre” proceeds with little urgency or suspense. Things unfold in the order and at the pace that they are capable of, and anything modern or insistent seems malignant. One of the armed police who accompany Monet to the dock when Idrissa runs away point automatic weapons at the fleeing child; Monet is incredulous and pushes the weapons aside. Later a commuter uses an anachronistic-seeming mobile phone to summon the police when he spots Idrissa; one of the neighborhood intervenes to allow Idrissa to escape before the police arrive. Time is slow here, and this kind of thing has no place. Time cannot trouble Marcel and his neighbors, and neither are they ever bothered by doubt. They make no trade-off between what is right and what is possible, which at first makes the whole down-to-earth business of the plot seem utterly unreal. Everyone is defined entirely by their actions, and their actions are matter-of-fact – a child is here, he wants to get there, and that’s just the way it is. There is almost no antagonism, because almost no-one does anything wrong. “Le Harve” is as optimistic and compassionate a film as I can remember, but the optimism and compassion are just the boxes that the simple actions of Marcel and his friends naturally fall into. This is an alluring escapism, so that by the end the whole fantasy seemed to make all the sense in the world. 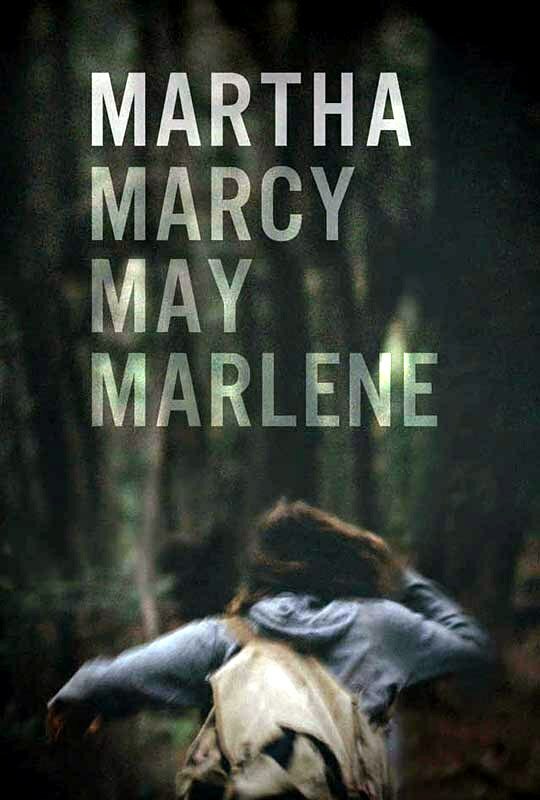 At the beginning of Martha Marcy May Marlene (2011), Martha (Elizabeth Olsen) sneaks past sleeping bodies on the floor of a rickety farmhouse and runs into the woods. She is spotted and briefly pursued, but makes it to town. She makes a desperate call to her sister Lucy (Sarah Paulson), who comes to collect her and take her to the Connecticut lakeshore vacation home of Lucy and her husband Ted (Hugh Dancy). Martha has run away from an extended stay with a small cult, whose leader Patrick (John Hawkes) had renamed her Marcy May. As she recuperates at Lucy and Ted’s home, she is haunted by the memories of the group. The film moves fluidly between her cult life and the scenes from her new surroundings that trigger Martha’s recollections, the boundary between present reality and memory blurry. The transitions are well-executed. Most jarring are the earliest shifts, since in them we move back to Martha’s arrival at the group’s upstate New York farmland commune. She is relaxed and happy, on a new adventure, in startling contrast to the broken, sluggish young woman we were introduced to. Over the course of the film the Martha of the past is ground through Marcy May into the Martha of the present. What of that Martha before there was Marcy May? She refuses to talk to Lucy about what has happened to her in the time since they last spoke, insisting that she had only been living with a boyfriend and left. We, of course, get to see plenty of Martha’s time with the group, but nevertheless I shared Lucy’s frustration. How did Martha end up there? She is brought in by her friend Zoe (Louisa Krause) and quickly and readily assimilates to some degree into the group identity, despite the brutal wrongness of the initiation. Why? It might well be an accurate picture of group psychology, but we are left to draw our own conclusions about what drove Martha there in the first place. Just as the cult dominates Martha’s thoughts, to the exclusion of everything else, we too never see beyond it. There is no “before”. Something similar is true of Patrick, who is the center of the group, and therefore in a way of the film, and yet in the end we see very little of him. We know nothing of his past, nothing of his motivations. Like everything else that Martha has experienced, he just is, which reduces him to little more than images in Martha’s memory. The overall effect is to render the scenes from the past somehow soulless. It would be gratifying to know more, though perhaps this would undermine the lifeless, hallucinatory feeling of the memories. In the present, once again, Lucy and Ted take on something of the same quality, Martha barely engaging them in any real sense. Ted is hardly an easy character to like: rich, English real-estate developer with money to spare, shuttling between his Connecticut and New York City homes. Comparisons between Patrick and Ted become easy and tempting, as the slightest hint of direction of Martha by her sister’s husband come to carry sinister overtones. Only once does Martha show real signs of fiery life. Her outlandish behavior and outbursts wear on Lucy and Ted; they cannot understand, because they have no idea of the severity of what she has gone through. Lucy tries to absolve herself of the years-old guilt she feels at not having supported Martha more, and invites Martha to share it. Ted pushes Martha to decide what she might want to do with herself. She explodes. To Lucy she parrots Patrick’s words to her: she is a leader and a teacher. What should she have to feel guilty about? She derides Ted’s materialism, accusing him of equating success with possessions, insisting that there are other ways to live. When cornered, she has lashed out; how much is the ethos of the cult and how much might at last tell us something about who Martha really is? But soon the flash has subsided and we are left back with Martha’s introversion and almost paranoid anxiety, the color of the other characters once again turned down. Olsen’s performance is gripping throughout, but we are doomed not to really meet Martha or any of the people around her. Whoever she was has been wrung out by abuse and trauma, the cult robbing Martha of her personality and robbing us of our chance to have seen it.